The wild years are over, and passion too comes across a little more composed. 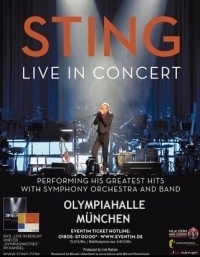 Here is Sting in the "Olympiahalle" in front of 9,500 fans, singing "Roxanne", and what sounded boldly snotty in the Seventies, sharpened by pithy reggae riffs, is now a soft tango – the adoration of a prostitute as a ballad. Sting's voice caresses, the strings exude warmth, and you imagine "Roxanne" as a harlot with soft round shapes, the red light a romantic promise. In such moments it is a trite reproach that Sting and his band, among them such impeccably playing veteran companions such as guitarist Dominic Miller, and the Bochum Symphony Orchestra water down even old Police material into soppy pop songs. Which is, in fact, true. But predictably so. The 59-year-old Briton has, for now, decided to quit sowing in favour of reaping. And with the intention to make this an epic poem, a touching one at that, refined by mellow strings and echoing brass. In the case of "Roxanne" this step onto the soft pad hurts a bit. For "King of Pain", however, anthem of all melancholics, the listener readily follows the crescendo of the horns and the dramatic sounds from piano to passionate orchestral forte even with his mind: melancholy is best savoured with a lot of pathos. Sting seemed in a good mood, yet he did not, as in earlier tour legs, spice up his songs with tales, but only had a go at German a few times. ''Ich bin sehr glucklich, wieder in Munchen zu sein'' - he still has to work on his Umlauts. While Sting appeared a bit weary of touring at times, conductor Sarah Hicks led her 46-piece orchestra nimbly swinging her hips. Christine Fischer-Eisenbrand had the privilege to introduce "Whenever I say your name" with a sweet violin solo, and particularly during "Moon over Bourbon Street" you could sense in the intense dialogue between the orchestra and the singer what a wonderful street ballad Sting has written here. He had a long vampire's cloak put on his shoulders for this - and that during the first part of the show he wore his shirt buttoned up incorrectly looked like a charming fashion statement. But perfection is not what the fans want anyway - they want closeness. During "Every breath you take" some ran up front to the stage – and stayed there. Then it was a rocky "She's too good for me", followed by a very soft "Fragile". Finally, playing the guitar, without the orchestra, he sang "Message in a bottle" and, with the fans, sent an SOS to the world. Loneliness is wonderful, together. Were you at the show? For photos, set list or to leave your own review, check out the event page for this show!